End of all things May 21 2011? Even Technology? | Jesus created science, we explore and enjoy it! End of all things May 21 2011? Even Technology? 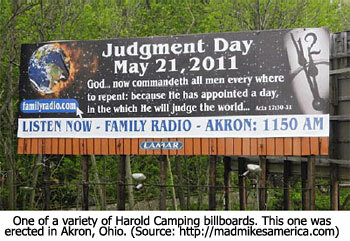 The Camping camp is wrong, Bible doesn’t guarantee that. Infact, the Bible guarantee jus the opposite. The Camping is wasting a lot of resources they could use for glory of God to do just a useless task. Ads in all those countries they have erected, all the promotions et al could be used to the glory of God! Anyways, another “millerite” failure is on the making, in final stages. And behold, the world is not going to end that day. Jesus is coming like a thief and I feel grief for the Camping camp already!